THE FIRST big overhaul for Facebook came in 2012-14. Internet users were carrying out ever more tasks on smartphones rather than desktop or laptop computers. Mark Zuckerberg opted to follow them, concentrating on Facebook’s mobile app ahead of its website, and buying up two fast-growing communication apps, WhatsApp and Instagram. It worked. Facebook increased its market valuation from around $60bn at the end of 2012 to—for a brief period in 2018—more than $600bn. On March 6th Mr Zuckerberg announced Facebook’s next pivot. As well as its existing moneymaking enterprise, selling targeted ads on its public social networks, it is building a “privacy-focused platform” around WhatsApp, Instagram and Messenger. The apps will be integrated, he said, and messages sent through them encrypted end-to-end, so that even Facebook cannot read them. While it was not made explicit, it is clear what the business model will be. Mr Zuckerberg wants all manner of businesses to use its messaging networks to provide services and accept payments. Facebook will take a cut. A big shift was overdue at Facebook given the privacy and political scandals that have battered the firm. Even Mr Zuckerberg, who often appears incapable of seeing the gravity of Facebook’s situation, seemed to grasp the irony of it putting privacy first. “Frankly we don’t currently have a strong reputation for building privacy protective services,” he noted. Still, he intends to do it. Mr Zuckerberg claims that users will benefit from his plan to integrate its messaging apps into a single, encrypted network. The content of messages will be safe from prying eyes of authoritarian snoops and criminals, as well as from Facebook itself. It will make messaging more convenient, and make profitable new services possible. But caution is warranted for three reasons. 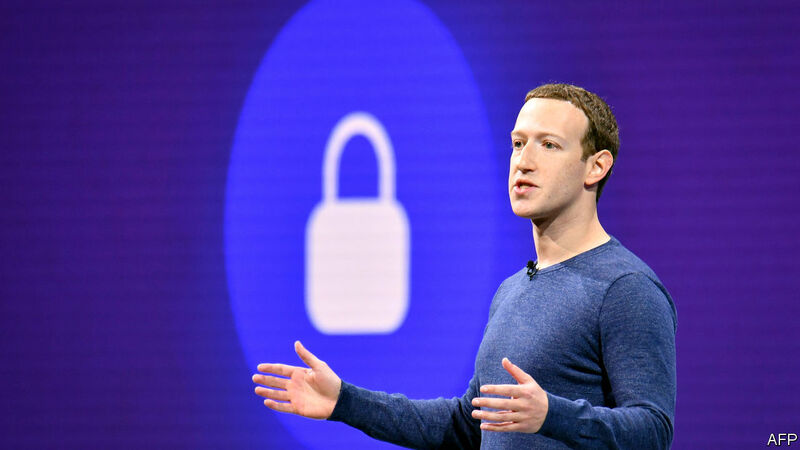 The first is that Facebook has long been accused of misleading the public on privacy and security, so the potential benefits Mr Zuckerberg touts deserve to be treated sceptically. He is also probably underselling the benefits that running integrated messaging networks brings to his firm, even if they are encrypted so that Facebook cannot see the content. The metadata alone, ie, who is talking to whom, when and for how long, will still allow Facebook to target advertisements precisely, meaning its ad model will still function. End-to-end encryption will also make Facebook’s business cheaper to run. Because it will be mathematically impossible to moderate encrypted communications, the firm will have an excuse to take less responsibility for content running through its apps, limiting its moderation costs. If it can make the changes, Facebook’s dominance over messaging would probably increase. The newfound user-benefits of a more integrated Facebook might make it harder for regulators to argue that Mr Zuckerberg’s firm should be broken up. Facebook’s plans in India provide some insight into the new model. It has built a payment system into WhatsApp, the country’s most-used messaging app. The system is waiting for regulatory approval. The market is huge. In the rest of the world, too, users are likely to be drawn in by the convenience of Facebook’s new networks. Mr Zuckerberg’s latest strategy is ingenious but may contain twists.